If you’ve never heard of Sonos, Sonos is a company/brand that makes wireless HiFi speakers for your home or office space. The speakers wirelessly connect to each other through your local network and flawlessly integrate Internet music services such as Rdio, Spotify, Pandora, and almost everything else that exists. You can also play your locally stored music from your PC, Mac, iOS device, or Android device through the Sonos software or Sonos app on your mobile device. A standalone remote isn’t necessary because you can control the music, volume, and EQ settings from any connected device that has the Sonos software installed. You also have the option to program your TV or cable remote to control the volume on your sonos devices if you’re using Sonos hardware in your surround sound setup. Although Sonos components are nowhere near cheap, they have one of the most simple setup processes I have ever used and it just works. I’ve wanted to enter the Sonos ecosystem for the longest time, but haven’t had the opportunity due to the steep cost of each product. After a little networking and finding a Sonos rep that agreed to sell me a few Sonos products at a discount, I jumped on the offer as fast as I could. I ended up getting two Play:3’s, a PlayBar, and a Sub as my intention was to use this as a surround sound setup with my TV. I couldn’t have made a better decision. When I received the boxes, they were made of high quality materials and each one was well packed with cardboard, felt, and other materials to avoid any damage while being shipped. The first piece I opened and setup was the PlayBar. In the box, it comes with a power cable, Ethernet cable, and optical cable. Setting up the PlayBar was a breeze. All I had to do was plug in the 3 cables and it was done. The next step was connecting it to my network. To do this, you need to have a device connected to your local network with the Sonos app or software installed. I used my iPhone 6 Plus to setup all of my Sonos products. I opened the Sonos app and chose “Add another Sonos system” and then chose to create a new Sonos setup. The next and final step was pairing the PlayBar with my Sonos controller, which was simply pressing the bridge and volume up button on the PlayBar. That’s it! It took maybe 30 seconds to get it setup. After the PlayBar was connected, I was auto-magically asked if I had a Sonos Sub that I wanted to add to the PlayBar. I selected yes, it asked me to press the bridge + volume up button, and voila, it was connected. Then, to my surprise, it even asked me if I wanted to add surrounds to my PlayBar and Sub. I selected yes, and asked me to press the same button combination on the left rear speaker and then on the right rear speaker. Adding all 4 pieces to my “Living Room” group in the Sonos Controller took about 5 minutes. The final step to get everything working with my TV was to turn off the built-in speakers in my TV and choose to use an external audio system. That was it. I was amazed at how simple it was. There were no speaker wires that I needed to hide. There was no audio delay between any of the speakers. Everything just seemed to work, and it worked perfectly. 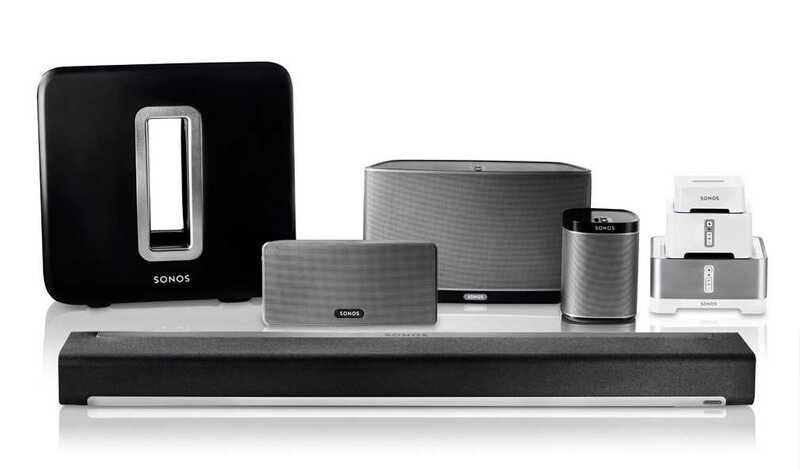 The Sonos ecosystem is an expensive, yet amazing option for a home or office setup. Yes, there are several less expensive options to Sonos, but you probably won’t experience the ease of installation, high quality, and great sound that the Sonos systems have to offer. One of the best features of Sonos is that you can continuously add speakers to your setup overtime, and you don’t have to buy everything at once (unless you want to!!) and the guys at Sonos expect you to do exactly that. They repeatedly state that you can “Start with one, and add more over time to fill your home with music.” If you’re not looking to use Sonos as a home theater system like I did, you can start with a Play:5 in your living room or office, and add Play:1s or Play:3s to other rooms in your house. While these are “wireless speakers”, they do require a power source, and unfortunately don’t have any kind of built-in battery option, which means you’re going to have to position your speakers near power outlets or run an extension to where you want your speaker to be. The only real downsides to the Sonos ecosystem is that it’s quite expensive to enter, and there isn’t any Bluetooth or line-in option (unless you get a Play:5 which has a line-in option). On the upside, the sound quality is amazing and you get exactly what you’re paying for, and it runs off your home network, which works flawlessly for me (I have an Airport Extreme router, with a 75mbps internet connection). Bottomline: I would recommend Sonos to any audiophile or music lover who can afford the steep entrance price into the Sonos ecosystem. Do you have experience with Sonos? Let me know in the comments below!